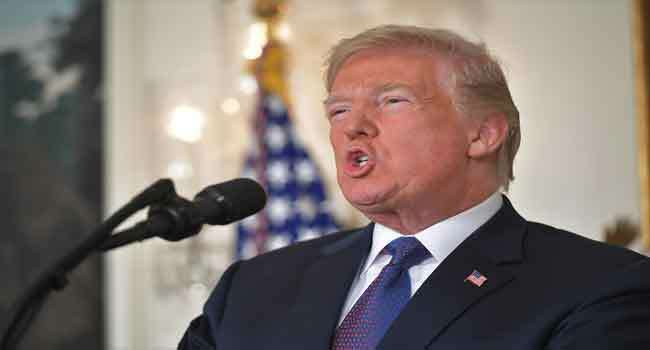 President Donald Trump attacked the probe into possible collusion between his campaign and Russia as a “political hit job” on Monday, as a part of a mounting White House effort to paint the probe as politically motivated. In the latest salvo from Trump’s administration and his Republican Party, the president assailed former CIA chief John Brennan, a strident critic, as having initiated the investigation. A day earlier, Trump demanded the Justice Department investigate the FBI for allegedly planting an informant in his campaign, and his lawyer pressed Special Counsel Robert Mueller to speed up the probe to avoid it affecting November’s mid-term elections. Both moves highlighted the heightened political stakes surrounding the year-old probe, as Mueller seeks to interview Trump himself amid growing chances of an impeachment effort against the president if evidence of collusion and obstruction of justice is found. “This was a Political hit job, this was not an Intelligence Investigation,” Trump said in a series of tweets, quoting Fox News commentator Dan Bongino. In recent weeks, Trump has stepped up his attacks on the Russia investigation, aiming to erode trust in Mueller’s integrity in the event the probe takes aim at the president himself. After hitting the one-year mark last week, Mueller’s probe has taken on increasing political weight as the country heads towards midterm elections. Investigators have already issued 22 indictments, including of top Trump aides like chairman Paul Manafort and former national security advisor Michael Flynn. More indictments are expected, but Mueller and his team have remained absolutely silent about the direction of the investigation and what evidence they have, especially with regard to Trump. Aiming to exploit that silence, Trump took to Twitter on Sunday to order the Justice Department to investigate the FBI’s implanting of “at least one” informant in his 2016 campaign, suggesting it was an act of political espionage by President Barack Obama’s administration. Late last week, some US media identified a British-based American academic and former government official, with longstanding ties to the CIA, as the informant who sought meetings with several Trump aides during the campaign at the FBI’s request. Deputy Attorney General Rod Rosenstein, FBI Director Chris Wray and Director of National Intelligence Dan Coats met Trump to discuss the issue Monday. Based on the meeting, the Justice Department will include in its ongoing investigation into the 2016 election “any irregularities with the Federal Bureau of Investigation’s or the Department of Justice’s tactics concerning the Trump Campaign,” according to the White House. Trump lawyer Rudy Giuliani added pressure on the probe, telling media Mueller hopes to wrap up by September 1 — a target date that no one on Mueller’s team has made public. The White House is gambling that by both pressuring and denigrating the investigation, Republicans can gain voter support ahead of the November elections. If Mueller finds evidence of criminal behavior by Trump, it is crucial the Republicans prevent Democrats from gaining control of the House of Representatives, which would rule on any impeachment motion. Analysts say Trump’s strategy to attack the CIA and FBI could be working. “The FBI and DOJ are reluctant to publicly respond in any way that makes them appear political,” said Julian Zelizer, professor of history and public affairs at Princeton University.